'Lady Independence' was released in 2008 and returned to the area with a mate to build a nest! 'Destiny' (L3) was released Summer 2013. Sighted by Joshua Anderson Feb. 2015. 'Halo' (L1) was released Summer 2011. Spotted in Ontario in 2012. Photo by Ron Kingswood. 'Justice' (E5) was released Summer of 2015. Sighted by Annette Piechowski on Lake Erie. 'Ranger' (F2) was released Summer 2012. Sighted in Ohio by Holly VandenBrick in Feb. 2014. 'Wilson' (V4) was released Summer 2014. Spotted in Michigan by John Clements Fall 2014. 'Semper Fortis' (N5) was released Aug. 4, 2015. Spotted in Ohio by Bruce Wunderlich Feb. 2016. 'Winfield' (N5) was released Apr. 24, 2014. Spotted in Ohio by Gary Dietz Sept. 2014. 'Survivor' (PH6) was released 7-9-16. Spotted in Canada on Mattagami River 6-1-17 by Betty Naveau. 'Chief' (K7) was released 6-28-17. Spotted in NW Ohio on 4-11-18. Photo: Eunice Koebel. 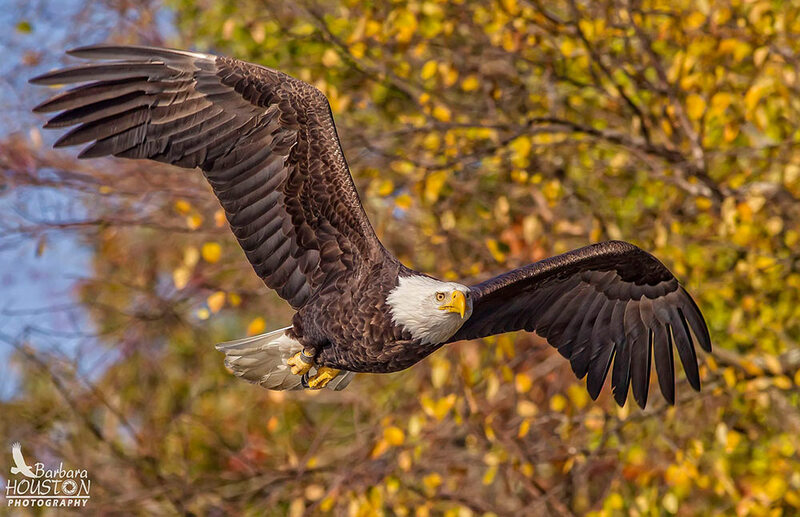 The AEF’s Captive Breed-and-Release and Hacking programs have resulted in the the release 166 young Bald Eagles and 11 Golden Eagles into the foothills of the Great Smoky Mountains in East Tennessee from 1992 through 2018. The AEF has also supported numerous recovery and protection projects in other states and has assisted with more than 100 other releases in Tennessee. Sadly, the success rate of Eagles in their first year is about 50%. 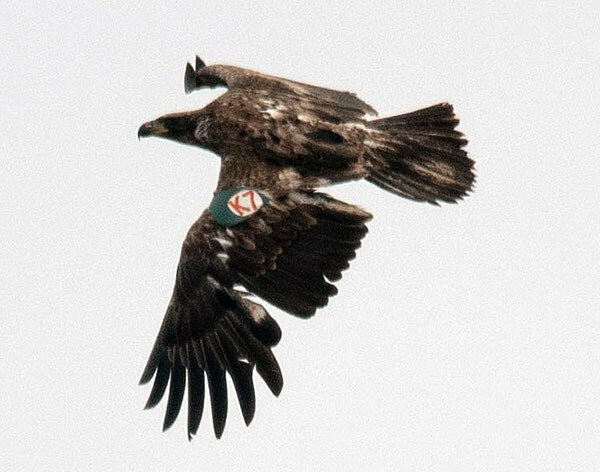 However, by receiving reports and photographs of Eaglets from people who have seen them years later—if they are still wearing their patagial wing tag or if their USFWS band can be photographed—we know our hacking program is successful. 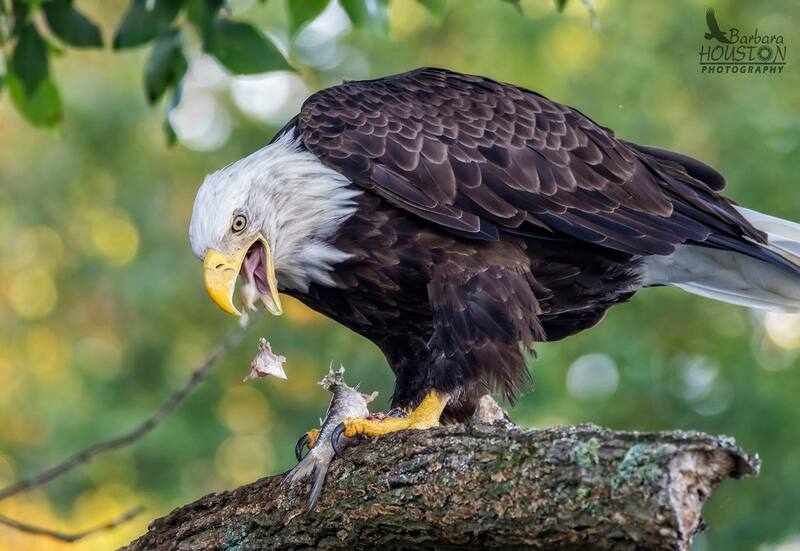 Our Eagles have been photographed in Ohio and as far away as the Great Lakes and into Canada. Amongst dozens and dozens of these sightings, the following success stories have especially spoken to the success of the AEF’s Captive-Breeding and Hacking programs. 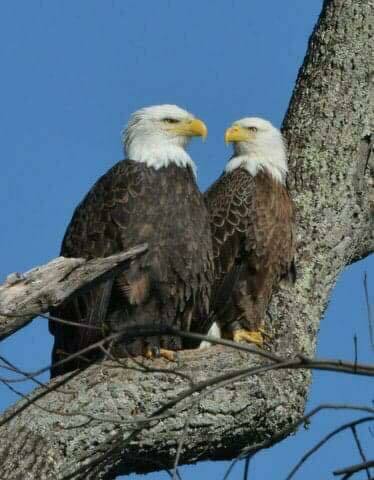 ‘Lady Independence’ & ‘Sir Hatcher’ are a pair of wild Bald Eagles that built a nest just 8 miles from the American Eagle Foundation in 2011. They have produced several young since 2013. In 2012, AEF volunteer John Prickett noticed the female of this pair was wearing a metal USFWS leg band. 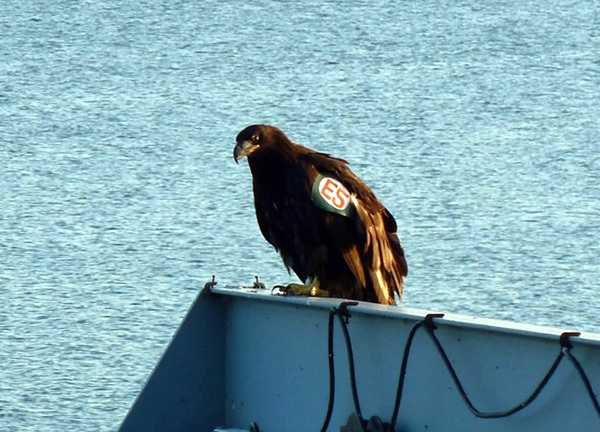 In 2014, he and a friend took photos of this band from different angles, allowing the AEF to piece the number together and reveal the identity of this Eagle. 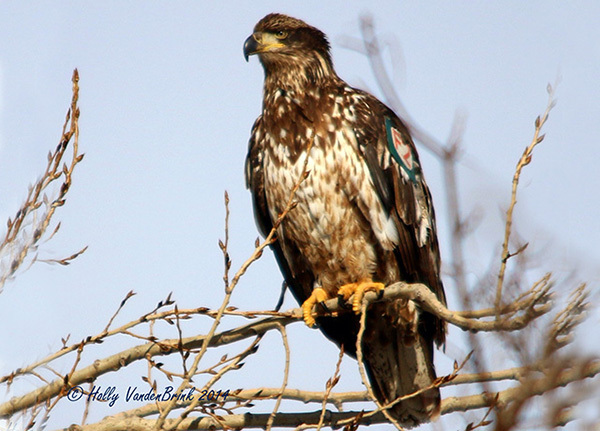 The AEF was elated to learn that this female had been hatched and raised by non-releasable Bald Eagle breeding pair “Independence” and “Franklin” and then released into the wild from the AEF’s Hack Tower on Douglas Lake in 2008! 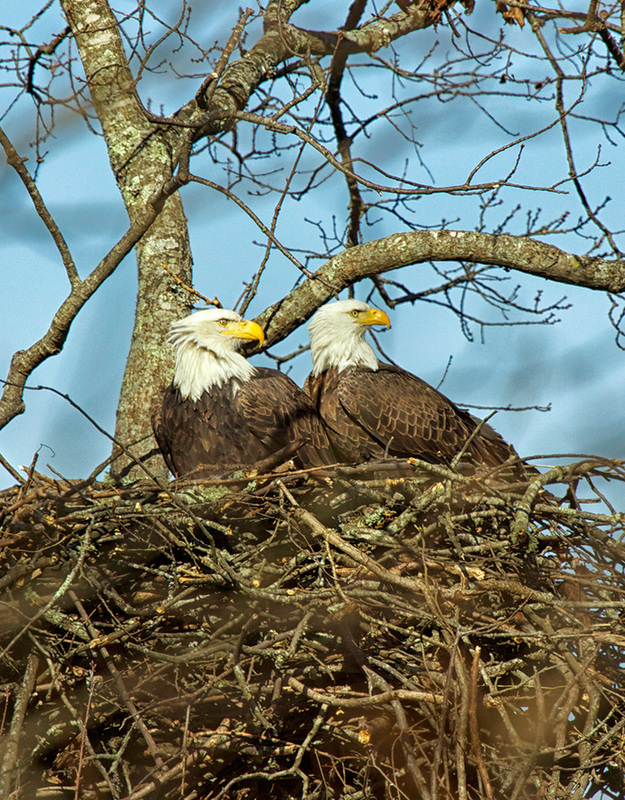 After fledging into the wild and reaching sexual maturity, she chose a mate and returned with him to the Pigeon Forge area to build their first nest! She was named Lady Independence in honor of her mother. 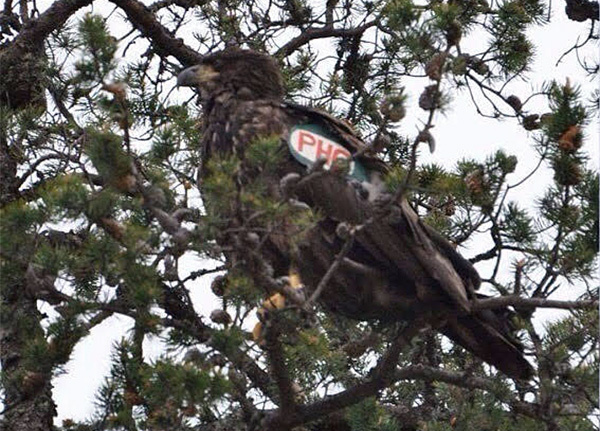 The male was named Sir Hatcher after Bob Hatcher, Eagle conservationist, who began the first hacking project in Tennessee. 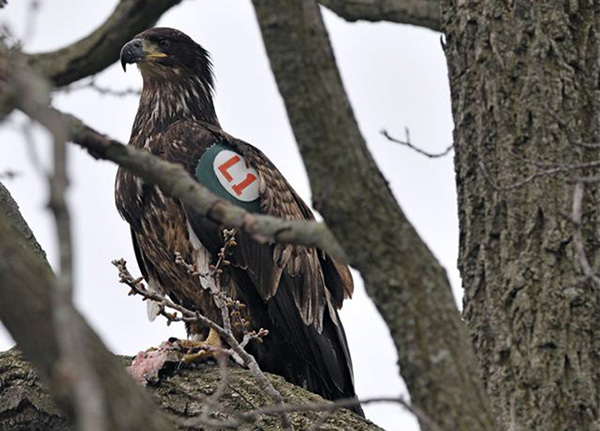 In the winter of 2018, local photographer Charles Collins contacted Al Cecere, AEF President, to inform AEF that there was a new male adult bald eagle seen perched with Lady Independence at the nest, and this eagle was also wearing a metal leg band. Mr. Collins made many attempts to capture the new male’s band number, but it wasn’t until March 23, 2018 that the new male’s band number (USFWS #629-43867) was confirmed by close-up photos. AEF records show the new male, now approximately 6 years old, was brought to AEF in 2012 because he failed to fledge from his wild nest located in Marion County, TN. The eaglet was placed in AEF’s Douglas Lake hack tower and was released at approximately 14-16 weeks old. 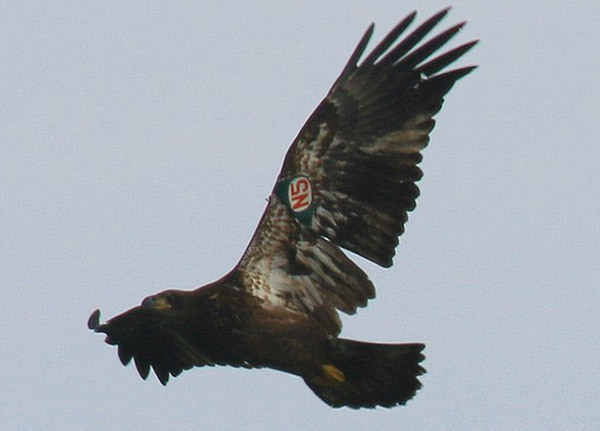 The eaglet was named Chattanooga at the time of the release, was given patagial tag of B2, and USFWS band # 629-43867. To continue honoring the contributions of Bob Hatcher to the restoration of the Bald Eagle in Tennessee, the new male has been named Sir Hatcher II. Three eaglets hatched in the nest during the 2018 season—4-3-18, 4-4-18, & 4-6-18. The parents were awesome and kept the nest well stocked with food. However, after 3 interventions of removing fishing tackle (hooks, lines, sinkers) from their nest, and facilitating the removal of a hook from one of the eaglet’s stomachs, it was determined by the USFWS and AEF that the safest action going forward was to remove the eaglets to the hack tower. They were at the right age to do that, and it ensured that they would not be in further danger from fishing tackle brought into the nest along with the fish. The three eaglets were successfully released from the Hack Tower on June 28, 2018. Read more about Lady Independence and the original Sir Hatcher. 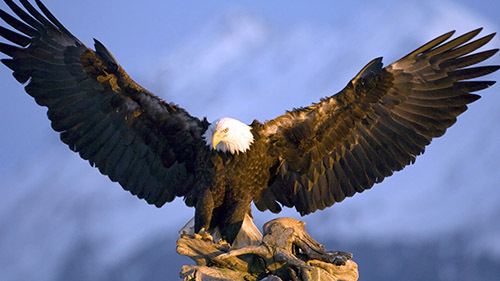 “Bandit” the Bald Eagle – A Story of Hope, Courage, Betrayal, Misfortune, Perseverance, and Victory! It’s a general truth in the realm of Bald Eagle biology that Eagles mate for life (unless a faithful companion should die — in which case, they will choose a new mate). However, there have been known accounts of infidelity and “divorce.” This is one of those instances, pertaining to an eaglet that the AEF released into the wild years ago. 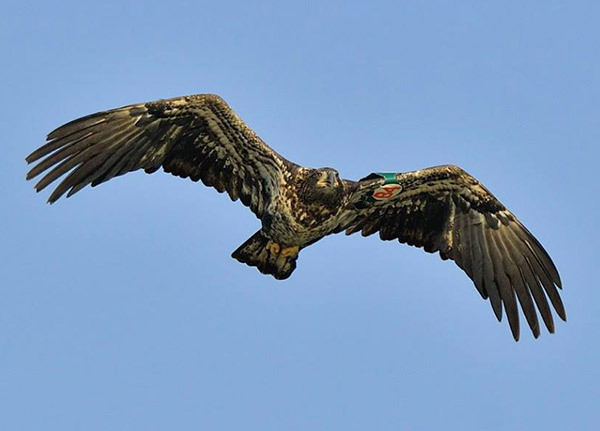 On June 8, 2005, a young eaglet, hatched in the Birmingham Zoo on April 26, was transferred to the American Eagle Foundation, placed in our Hack Tower on Douglas Lake, and subsequently released on July 24, 2005 with an identifying wing patagial tag and leg band. In a nationwide contest, the eaglet was named “Dolly” in honor of Dolly Parton. Once her leg band was identified, Capt. Mike contacted the US Fish and Wildlife Service to find out where she came from, then contacted the Birmingham Zoo where she had hatched, and was able to speak to the caregiver who watched her hatch and who later delivered her to the American Eagle Foundation where she was released at 13 weeks of age. In year one (her first breeding season in 2010), Bandit and her mate (Smokey) built two nests but both fell. If she laid eggs, they fell with the nest. In year two (her second breeding season) Bandit laid her clutch, but 2 intruding eagles (another bonded pair) tried to take over her territory, landed in the nest, and crushed the eggs. Later that year, the nest fell again; this was the fourth time the nest had fallen in less than two years. A second male had been hanging around for awhile, so there were 3 eagles in the territory: 2 males and Bandit. After the nest fell this time,Bandit changed mates. Now it was Bandit and The Duke. Smokey had been replaced and left the area. Soon thereafter, there was a second female eagle in the area. The Duke was unfaithful, and spent his time between Banditand the “other lady.” This went on for 3 years. In breeding seasons 3 and 4, Bandit did not lay eggs, probably because there was not enough mating between Bandit and The Duke. In breeding season 5, Bandit and The Duke became closer, and eggs were laid. But the other female was still in the picture. The other female flew into Bandit’s nest and attacked her fiercely. Bandit disappeared for about a month, and during that time, the other female took over the nest and began to incubate Bandit’s eggs. However, the other female grew tired of that, and stopped incubating, so the eggs did not hatch. But even after she stopped incubating the eggs, the female stayed in the area. Bandit finally came back a month later and managed to regain her territory, although she was terribly beat up, feathers missing, plus a lame foot. In the fall of 2014, another pair of bonded eagles, male and female, came into the territory, looking for a nest. They either killed or chased off The Duke, who hasn’t been seen since. In 2015 (Bandit’s 6th breeding season) Bandit and Trey bonded. They mated and an egg was laid. The egg was incubated for two months, but was not viable. Bandit “double-clutched,” laying another egg (5 weeks behind other eagles in the area). This egg hatched, producing her first eaglet, now between 7 and 8 weeks old. Knowing the full history of Bandit (aka Dolly), Capt. Mike named her offspring Dolly. We thank Capt. Mike for sharing this amazing story with us! Update: September 23, 2017: Bandit enjoys a fish dinner! Thanks to Barbara Houston (once again) for sharing this wonderful image of Bandit. Update: December 6, 2016: Bandit is alive and well! This magnificent photo of Bandit was captured by Barbara Houston.